Ohio State beat Michigan today for the 5th year in a row (sorry Eric)!!!! And actually, the game was kind of a bust because Michigan sucked so bad. Usually the game is close and exciting and I'm jumping up and down screaming, but not so much this year. Don't get me wrong though, I am so happy my beloved Buckeyes won! 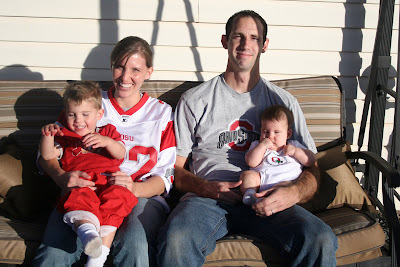 Here is our annual family Buckeye picture. Yes, we are NUTS! After the game, we headed to the Christmas parade. Talan had so much fun seeing the tractors, trucks, and horses. And, he did such a good job of taking care of his sister in the wagon. I miss the Christmas parade! Fun! What a good big brother he is. I just learned that a buckeye was a nut. I never knew before....funny. Ah, the annual Winslow parade. Its so funny that we have a Christmas Parade before Thanksgiving... But I gotta say, I LOVE the Fry bread!